Stark white walls hold a small collection of art: traditional photographs and paintings as well as slightly nontraditional graphic design posters featuring a rainbow of typography. They hold sculptures atop simple ivory plinths, ranging from a coral-like structure with mirrors on the inside to what looks like the framing from a bike and its horn covered with Silly String. Based on this description alone, the collection may seem mismatched, a hodgepodge of artwork with no clear rhyme or reason, but it somehow works. EXHIBIT A FOR ART: The juried student exhibition features sculptures, paintings, and photographs, as well as graphic design projects made by students throughout the year. Perhaps more impressive is that students made all the artwork on display in the modest gallery. More specifically, these were Cal Poly students. After all, it is the University Art Gallery. The annual juried student exhibit showcases the photographs, paintings, sculptures, and graphic design work that students made throughout 2014 and 2015 thus far. 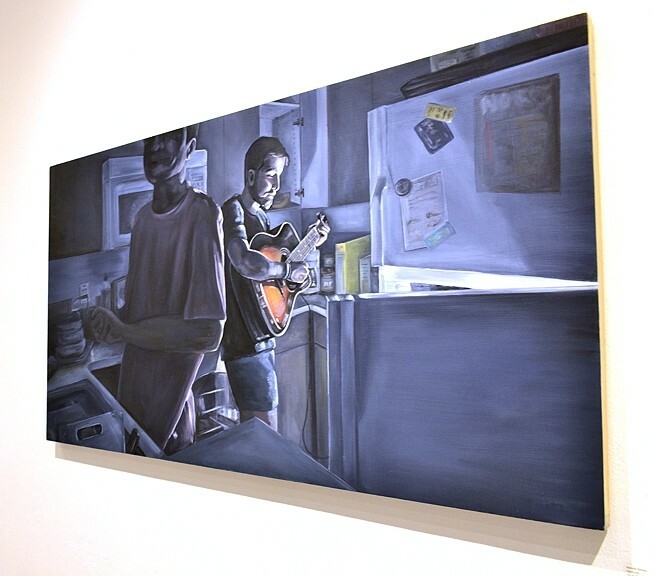 One of the pieces, Nocturne, depicts a musician standing in front of the fridge, clutching his guitar, while another person is making a midnight snack. The only light—in the painting that is—comes from the bulb inside the refrigerator, streaming in from the door left slightly ajar, illuminating a bright sunburst on the guitar. The rest of the painting has the muted colors typical of a room bathed in darkness. The artist, fourth-year art and design major Kendra Dimino, said she drew inspiration from the curious habits of her creative-minded friends. MIDNIGHT RAMBLER: Kendra Dimino’s piece, 'Nocturne,' celebrates the dedication of aspiring musicians. Dimino said she starts her paintings with an idea, staging a photo shoot in order to get a reference. She picks the photo she wants to use, playing around with the composition and perspective until she gets what she's looking for, and then begins to paint. Though she started with her usual process for Nocturne, she ended up with something completely different. Dimino, a painter by nature, has another submission on display in the exhibit, this time a photo series called Teflon Galaxy. The series—which placed first for Best in Show—stemmed from an assignment focusing on out-of-context photos that Dimino undertook in a photography class. The seven photographs depict ethereal-looking orbs on a stark black background. Though minimalist in presentation, the colors are the real draw. One is a rusted gray color, texturized with what appears to be mountainous terrain. Another is a burnished bronze, and one is a multi-faceted sphere in shocking sapphire. The pictures themselves are striking, but they garner even more interest upon discovering what they truly are: merely the bottoms of Dimino’s kitchenware. 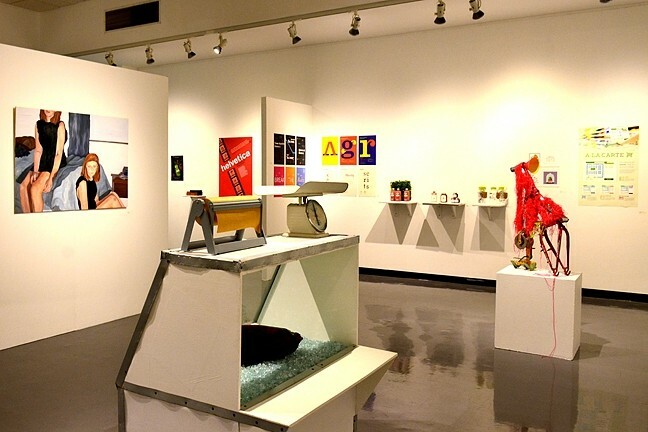 THE JURY’S OUT: The Cal Poly Student Art Exhibit runs through May 15 at the University Art Gallery in Building 34. The gallery is open Tuesday through Saturday from 11 a.m. to 4 p.m. For more information about the exhibit, call 756-6038 or visit artgallery.calpoly.edu. Intern Adriana Catanzarite is out of this world. Contact her via Arts Editor Jessica Peña at jpena@newtimesslo.com.